I hope you are all enjoying your summer. I will make this short and sweet because I know that you are busy. Coming up this weekend, August 6 & 7, is the Horticultural Centre of the Pacific's "Art and Music in the Gardens". The gardens are located at 505 Quayle Road, off of West Saanich Road. I will be located on the top rotund (by the entrance) in location #6, the same as last year. The venue is open from 11 am - 4 pm. 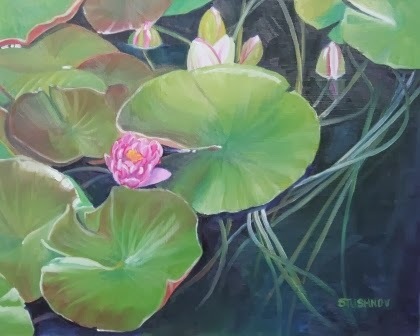 It is worth the trip just to spend time in the gardens, but this weekend you will also be treated to over 50 artists and artisans displaying and selling their work. There will be live music on three stages and food & drink. Nourish, the restaurant at HCP, has very good food. I hope to see you there! I have certainly put in more creative days than this, but have managed to lose count now! On the bright side, I have found a very workable studio set up for painting my still lifes. This is a work in progress on my latest painting. I have a light coming from the top right that I can adjust and my paints are off to the right on my desk. It seems to be working very well! And here is the finished piece . . . .
Day 11 - I swear there must be pigs flying around out there today because I've been in the studio two days in a row! I must apologize for the slight bit of glare in the top right corner. I took about a dozen different photos in various lighting arrangements and this was the best that I could achieve today. The lovely little piece of crockery was found the local thrift store. I purchased the sunflower on the way home from the dentist today and the maple leaves were collected on one of my walks. 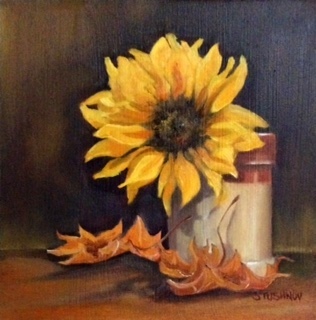 I find sunflowers very interesting to paint and it always makes me happy to look at them. Gabriola is such a beautiful island. I have been lucky enough to visit there a few times; twice for painting trips and always with dear friends. While there we stayed at The Haven which is situated right on the beach. In the evening after dinner, you can wander out and watched the sunset or stroll down the beach. There is a lot of limestone on Gabriola and the beach on the left side of the The Haven has quite a collection of Inukshuk's that people have created. This is my rendering of one of them. Oil on Canvas - 10" x 10"
Life happened along this week with work and company for the Thanksgiving weekend, so I haven't had much time to paint or sketch. I did do a little sketch on Thursday, (Day 4) but I won't be posting it. Today is the first opportunity that I had to get at the easel. I had an idea of what I was going to work on today. While putting things away before company arrived, I came across a painting that I had started many, many months ago. A little history on the piece. . . . my friend, Marcela and I were in a show at the Community Arts Council Gallery and had volunteered to sit the show and paint while we were there. I really wasn't in the mood to paint and it was challenging to be in the gallery with different lighting and people coming and going. So, what came off the easel that day really wasn't floating my boat. When I found it on the shelf I felt that the overall composition was okay, so today I decided to see what I could do by going back in and loosening things up. I deepened all of the reds and cleaned up the centres of the poppies, then I tackled the background because that was really where the major problem was. It's quite interesting what can happen when you let the muse come out to play!!! As often happens, I painted like a mad woman for a while and then needed to take some time off to regroup. I spent time in my garden, puttered around doing "house" things, read books and basically re-charged over the summer months. It seems to have done the trick. I'm feeling the creative surge welling back up. Recently my friend, Marcela embarked on a journey . . . 260 days of making art over the next year and she invited me to join her. In fact, she invited everyone to join her, but on their own terms. That works for me because right now, life for me is about finding balance. So I decided to commit to 182.5 days of making art. Okay, 183 days. That's half a year. That means that over the next year I will spend at least half of the days making some kind of art; a painting, a sketch, a floor mat, ART! I started off my journey by finishing off this painted floor mat that I was working on. It's 3' x 4' and it was fun to do. I'm thinking I might need to make another for my front door! 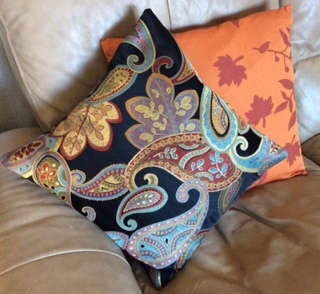 I also sewed 4 new cushions for my living room. (The paisley ones, not the orange ones.) Not painted, but creative none the less. Yesterday was the second day of the journey and I decided to get out a canvas. The end result . . .
Today was a plein air day! After dropping the kids at school, I took some time before meeting my painting buddies (Marcela and George) to photograph the glorious colours of the sunrise. The sky was absolutely amazing and I can't wait to paint some of those images when the inclement weather hits. But, back to today. . . . we met at the Oak Bay Marina where there are a plethora of scenes waiting to be painted. I settled on this lovely little wooden boat with the trees of Glen-Lyon Norfolk school behind. It started out with some decent light but quickly clouded over and cooled off. 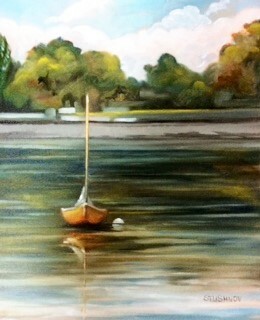 But, we persevered and this was what I ended up with. .
"Oak Bay Marina, Early Autumn"
Tonight it's off to pottery class. Yikes! Look out people. I am not the most co-ordinated person in the world. Lord knows where that clay might end up! 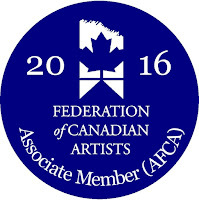 It's Been A Long Time Coming . . . .
Today was the day . . . . the day when all who applied would hear the results of their application for signature status with the Federation of Canadian Artists. It is quite a process to get to the point where one can apply. First you must be juried to Active Status so that you can enter Federation Shows. Then the artist must have work accepted into eight different shows with eight different paintings within a period of four years. All of the shows must be on the list of shows considered "qualifying" shows by the FCA and two of the shows must be at Federation Gallery. 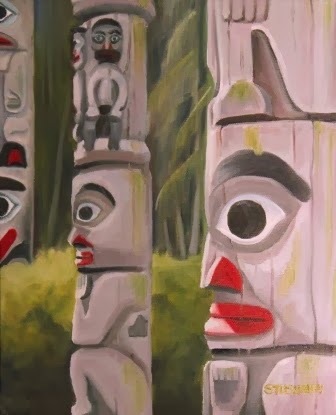 Finally, when the artist has enough shows under their belt they can apply for signature status by submitting ten images, the application and delivering three original paintings to Federation Gallery in Vancouver. On a specified day (today) the Board of Govenors (which is comprised of Senior Signature Members or SFCAs) meets and the jury process begins. An artist must have a majority of votes from the Board of Governors to be awarded signature status. I had enough chapter shows and other shows, but needed some Federation Gallery shows, so I submitted to three shows at the gallery earlier this year and was accepted into all three. At that point, I had two original paintings but required a third one. So, I decided to paint the painting above, "Caressed By the Sea". It is another in my Driftwood series. 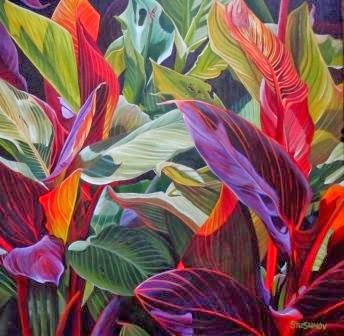 The other two paintings I submitted were from my Tropical Leaves series. I delivered my paintings, gave it up to the universe and then the wait began! I did pretty good at not obsessing about it. My good friend Alice, who is an SFCA herself, was visiting with her husband Billl and so we filled the days with painting, play and visiting. They left last Saturday and I kept busy catching up on errands and yard work. Today I went out and played in the garden and did a little retail therapy while waiting for the phone call. It came at just after 4 o'clock this afternoon. Thank you so much to the Board of Govenors who saw fit to award me my signature status!!! I'm absolutely thrilled to pieces! WORLD-WIDE BLOG HOPPING . . . The idea behind World-wide Blog Hopping is for us to introduce and promote one another. Follow the links to go around the world, finding wonderful art and artists. To learn about each other, we are all asked to answer the same four questions. I am fairly new to blogging and I confess that I struggle to blog consistently. But when my friend Alice Saltiel invited me to join this event, I couldn't say no! I have known Alice for almost 40 years and I was honoured that she asked me to be a part of this. She was my mentor and taught me so much about art. Alice can paint anything and paint it magnificently! You can check out more of her work here. Alice was invited to participate by her friend Win and you can find her work here and from Win's blog, you will be able to go even further back and check out more blogs. I invited my friend, Barbara Callow to join me in this fun little endeavour. 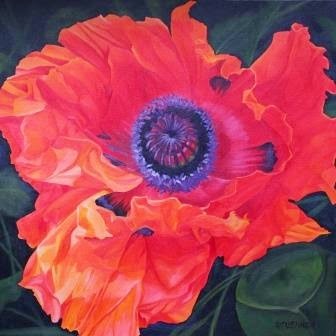 She is a signature member of the Federation of Canadian Artists and a very gifted lady who works in a variety of mediums. 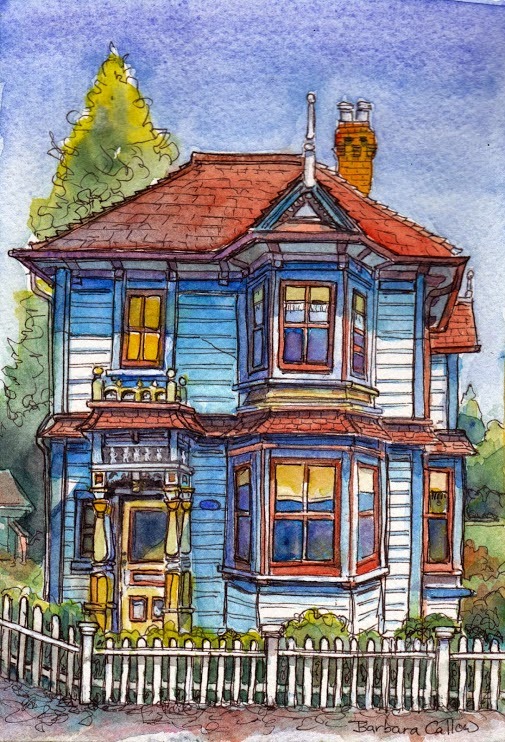 Beautiful watercolours, fabulous oils and her pen, ink and watercolour sketches are simply amazing! You can see more of Barb's work here. I was hoping that my dear friend Marcela Strasdas would be able to join me in the Blog Hop, but unfortunately due to a family emergency, she is not able to participate. I would still like to share her wonderful work with you though. She is so much better than me at blogging regularly. You can see Marcela's work here. I'm hoping that some time in the future she might be able to join us. I am a representational painter and I work in variety of mediums; mostly acrylics and oils, but I've been known to do a few watercolours and even make some prints. Having said that, there is a part of me that is very eager to get out the big brushes and a try a more abstract approach to things. I think as artists, we should always be open to new ideas and concepts and continually challenge ourselves so that our work stays fresh. Now on to the four questions . . .
1. What am I working on? Currently I am getting ready to begin a new painting as a part of the Island Illustrator Society's "2015 Travelling Alphabet Show". This is an annual show that the Illustrators and this year the theme is "Explore Victoria", so each of the subjects are reflective of that. I have chosen the letter "G" for Gate of Harmonious Interest. 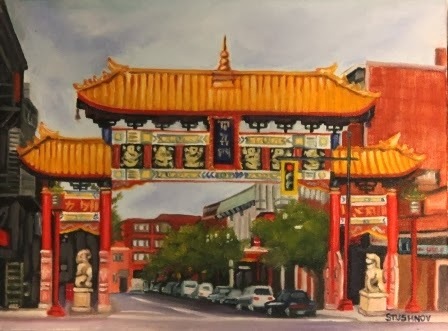 This is the beautiful gate that is at the entrance to Chinatown, the oldest Chinatown in Canada. Below is another painting of the gate that I did for a 30 in 30 challenge earlier this year. 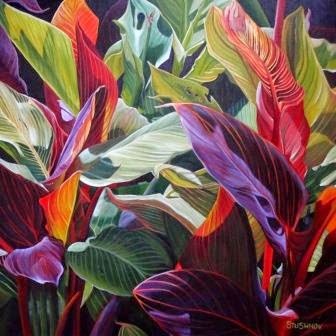 Once I have finished that, I plan to begin work on a few more paintings in my "Tropical Leaves" series. I grew canna lilies on my deck in the summertime and have a wealth of new reference material that I need to sort through and sketches to prepare. 2. How does my work differ from others of its genre? Light is one of the key components I look for when choosing a subject. As I said, I grow canna lilies in pots on my deck so that I can move them around and catch the light through the leaves. 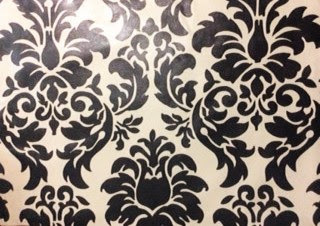 It creates some beautiful contrasts and can drastically change the colour patterns that are produced. 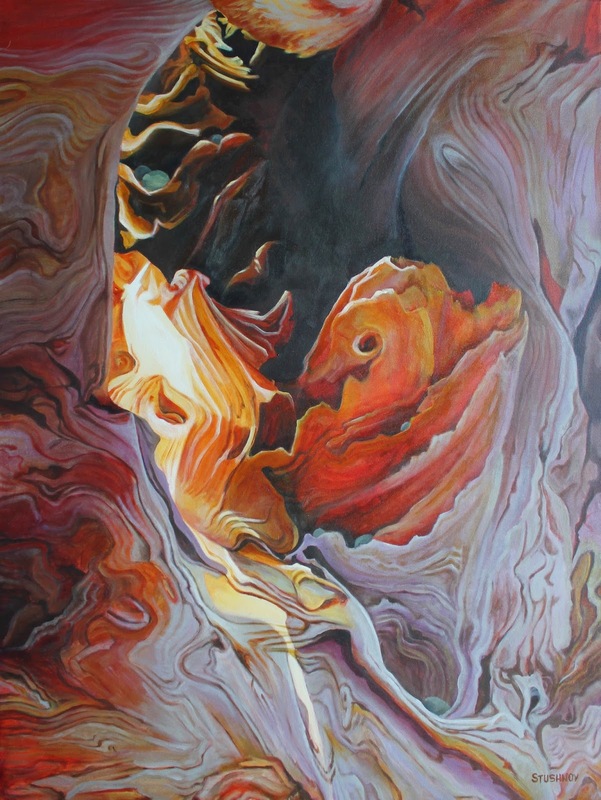 Because of the strong contrast between light and dark my paintings tend to be quite vibrant. Oh, and I LOVE colour! It makes my heart sing. 3. Why do I create what I do? I have always created things in one form or another for as long as I can remember, be it knitting, sewing, drawing or painting. And I have always, always been attracted to COLOUR! As a child I swooned over the new box of crayons. In social studies, I loved colouring the maps with Peacock Blue, Magenta, Coral and Lime Green. But, ART was always my favourite subject. Drawing, painting, printmaking, copper tooling, pottery; I loved it all! My mother taught me to knit when I was a young girl and to this day it still thrills me to walk into a yarn shop and see all the colours on the walls. I could spend hours there. The same goes for art supply stores. The prospect of taking those paints and playing with all of the beautiful colours fills my spirit. I still knit in the evenings; creating multi-coloured socks and patterned sweaters. I can't imagine what it would be like to live in a black and white world. 4. How does my creative process work? I find inspiration in many places. It can be the way the light falls on something and the patterns that are created in the shadows. 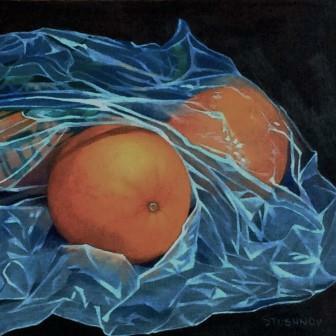 It can be some great objects that I put together in a still life or it can simply be a subject that moves me. More often than not there is some great colour associated with it. Though lately, I have found myself drawn to the beauty of monochromatic, more natural colour schemes that are much softer than I usually paint. I'm feeling drawn to explore the softer side of light and colour. Sometimes I work from life, sometimes from photographs. Regardless of the reference, there has to be something that inspires and speaks to me. More times than not, I will tone my canvas with a dilute red iron oxide or something similar and sketch my base in with a stronger red iron oxide. If it is large and very complex painting, I will work a draft up on newsprint and transfer it over to the canvas after I have ironed out all of the problem areas. Occasionally, I will start with a black canvas and work forward. The "In the Bag" series is a perfect example of that. 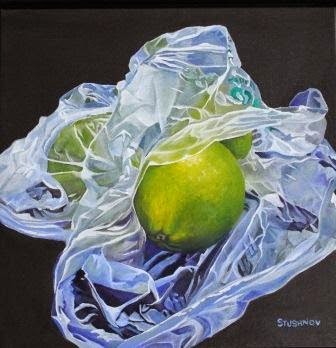 The exception was a painting that I did of persimmons in a brown bag and the brown bag was a whole new challenge that I would like to explore further. SO many things to paint and not enough time!!! You can see more of my work on my website and please sign up for my newsletter. Thanks for blog hopping with me! 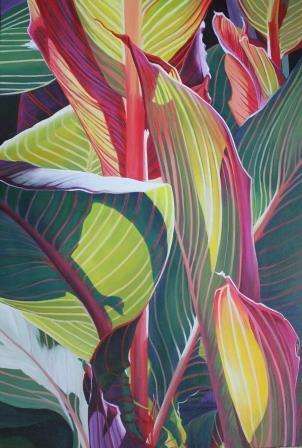 Canna #6 - "Waiting to Unfurl"
Acrylic on Canvas - 40" x 30"
I'm very, very pleased to announce that the 6th in my series of canna paintings "Waiting to Unfurl" has been accepted into the Sooke Fine Arts Show! There's always a bit of angst awaiting the jury's verdict! The image that I used for this one had some really interesting colouring on some of the lower leaves. Each painting has different challenges to deal with and a personality of it's own. On another note, I have a whole new batch of canna lilies growing in pots on my deck again this year so I can have some new reference material to work from. It took a little bit of looking around to find the Tropicana lilies (the ones with the purpley, burgundy leaves) but I found some! 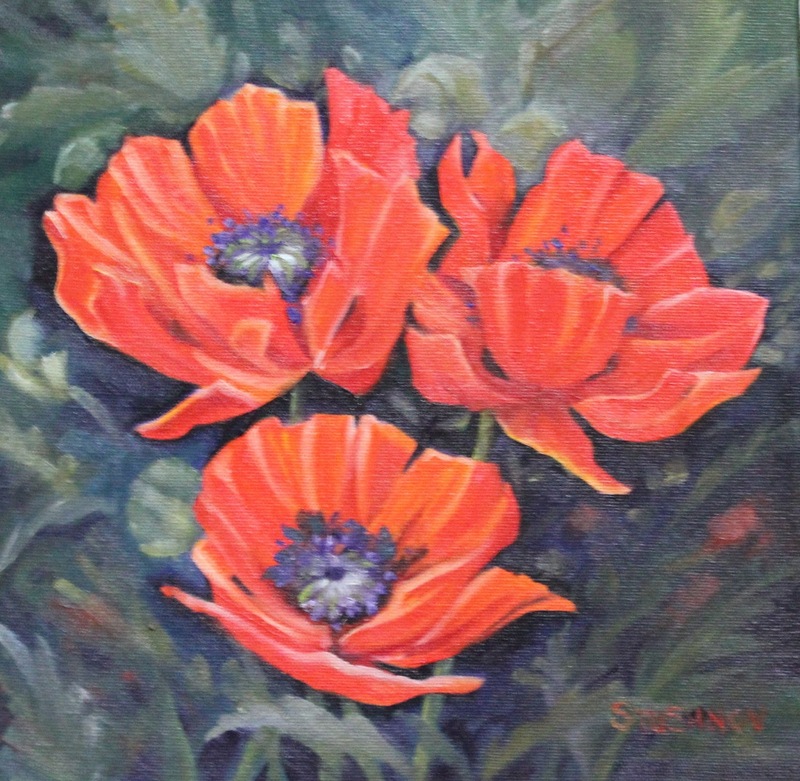 The Sooke Fine Arts Show runs from July 25th - August 4th at Seaparc Leisure Centre in Sooke. I hope that you can make it in to see the show. 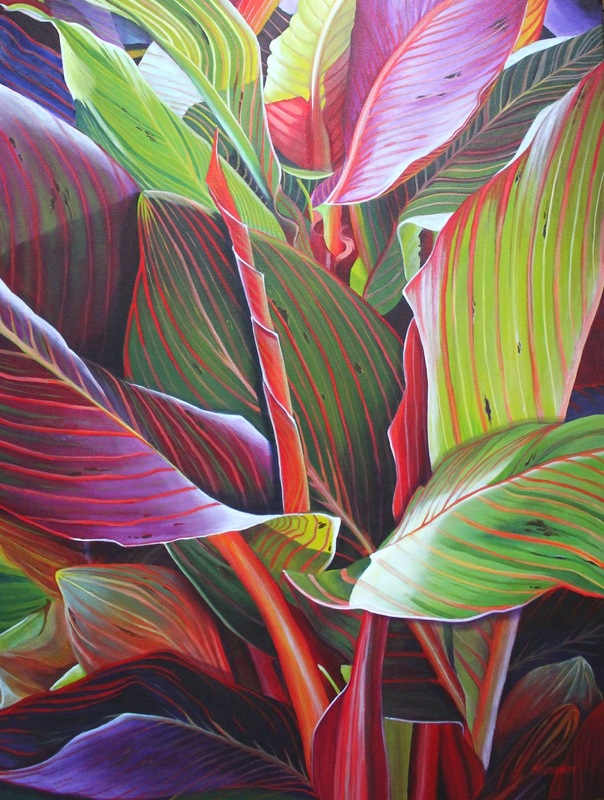 "Canna #5 - Block In"
This is the start of the next painting in the Tropical Leaves Series. A thin coat of red oxide and then sketched in with the same. I should have taken a photo of the in-between stage. 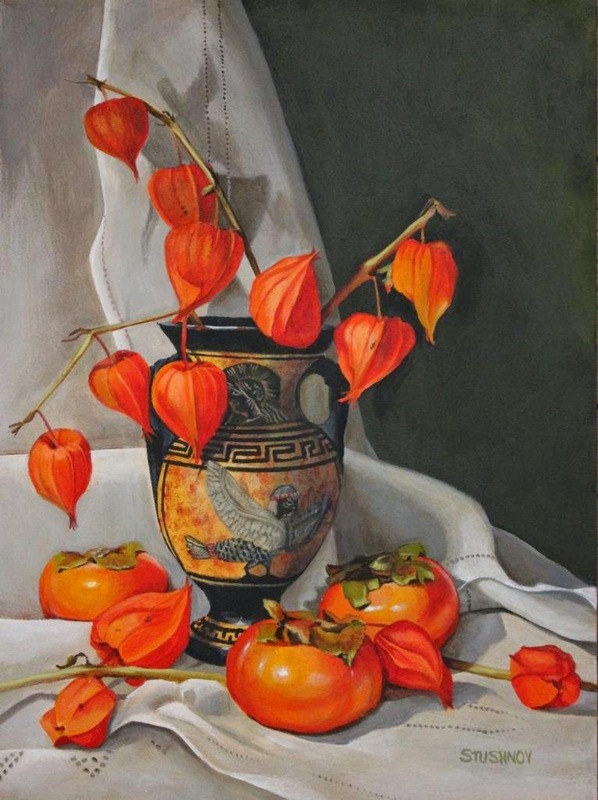 It is an interesting stage to paint, albeit a little bit confusing to follow the shapes and make sure that they marry up with the correct leaves. Then comes the fun part of adding the veining which in turn helps to give the leaves their shape. Then comes the really exciting part when I start adjusting the temperature, picking out the highlights and knocking back the shadows. It's what makes the painting sing! I realize when painting this one that many of the colours in these paintings were colours that I used to gravitate to when I was a child. My maps in socials class were always coloured with violet, orange, coral, lime green, yellow and peacock blue (I remember the name of that one!) I guess some things just stay with you. Anyway, here is the finished piece and I'm now eager to get on to the next one. I'm on a roll here and I think another canna might be in order! 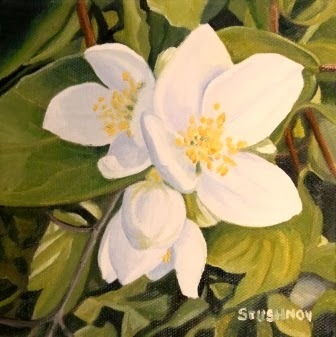 This was the painting that I started in the post below and has been completed for a few weeks now, but I did not want to post it in the blog until after the opening of the Federation of Canadian Artist's Spring Show. Jurying for the show was on Monday and it is always a tense time. There are so many excellent and talented artists that enter work. I see the work that comes in and I am always excited to hear that my piece has been accepted because, honestly one just never knows! 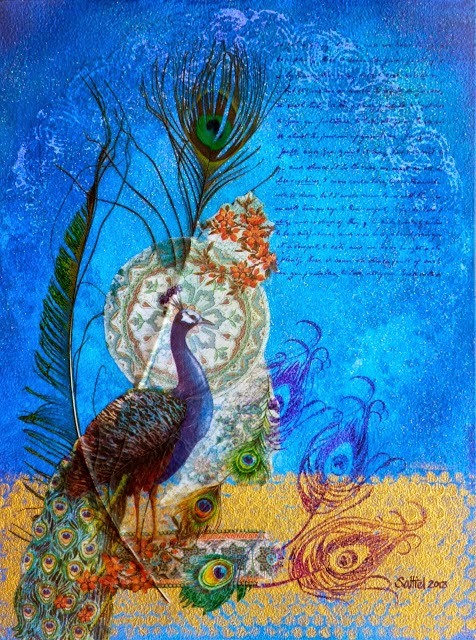 As well as being accepted in the show, "Illumination" was awarded 2nd prize so I am beyond thrilled. I enjoy painting the pieces in the Driftwood Series very, very much. It is a meditative process, tracing the lines and the movement of the grain. I love all of the various textures that are found in the pieces of wood; bleached to almost white by the water and sun; orange, red and umber where the wood is still wet; smoothed by the pounding of the waves, exposing the whorls and swirls of the grain; sharp jagged edges where it has been chopped with an axe and soft feathery edges where the grain has been shredded by the sea. All of it can be found in the same piece of driftwood. Along with the textures of the wood itself is the joy of hunting out the inevitable pebbles and stones that the pounding waves have lodged into the crevices and cracks; some of them large and some of them very tiny, but almost always there! And of course there is the light. Always the light! Back in the Saddle . . .
Well, it has been 16 days since my last painting. I had to catch up on things around the house, clean up my messy studio and finish up the paintings from the challenge. The last couple of days I have spent time going over what seems like millions of photographs, cropping and trying to decide what my next project will be. Plus I have a commission that I need to attend to very soon. Perhaps I'll work on two pieces simultaneously. I couldn't let it go on one day longer, this no painting! I cleaned up my acrylic palettes, cleared off my drawing table and pulled out a nice fresh white canvas and set to it! Last month I made an impulse buy; a jar of Golden red oxide acrylic paint that was on sale for a good price. It's not a colour that I usually use when painting with acrylics, but something in my head said, "Go for it! You know you'll use it!". Having said that, I have used transparent red oxide with my oils and quite like it. Today I cracked the jar open and used it to block in my next painting; the fourth in the Driftwood series. I think that this could become another favourite colour, especially for sketching and blocking in! Oh heck, who am I kidding? . . . . I've never met a colour that I didn't like! I love them all! They all have something redeeming about them. It sure does feel good to pick up the brush again and I must say, I'm finding that I have retained some really good things from the 30 in 30 challenge! I took the day off from painting yesterday and had lunch with my friend Marcela (who also did the 30 in 30 challenge). 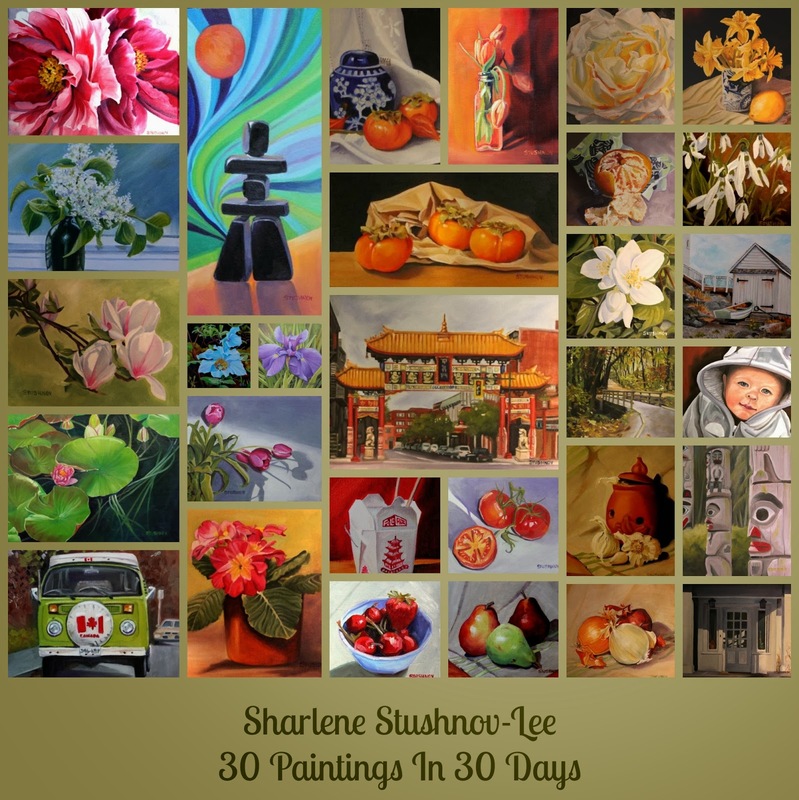 This morning I put together this collage of my 30 paintings in 30 days. Looking forward to painting some bigger pieces now. That is after I finish up these 30 and send off the ones that need to be sent off, etc. Oh, and after I clean up my studio. It looks like a bomb hit! "The Gate of Harmonious Interest"
The last painting of the challenge . . . . . . . . Since it is Chinese New Year tomorrow, (year of the Horse), it was suggested that I paint something with an Asian theme. Something involving lucky red envelopes and fortune cookies. I had good intentions!!! I always have lucky envelopes on hand and I even bought a bag of fortune cookies. Alas, before you could say "Bob's your uncle" (yes Laur, I know he is!) my boys devoured them!!! As I wasn't about to venture out to the grocery store last night, I decided to paint the Gates instead. A little history. . . .the gates are at the entrance to Chinatown here in Victoria and were erected in 1981. It was a joint project between China (where it was built) and Canada. Two inscriptions allude to this cooperative effort: "To work together with one heart" and "To help each other achieve harmony." I've been hanging on to this picture for quite a while now. I sketched this in last night and it wasn't really as difficult as I had anticipated. Honestly, the trees intimidated me more than anything. I see that I have the right lion off just a bit. I'll need to fix him. This was very fun to paint and I now have an intimate knowledge of the gates. For all of these years I've seen them, but not really SEEN them. That's it folks! That's 30 and I lived to talk about it. Thank you so much to everyone who has followed every day! I appreciate all of your wonderful comments. Without you, it wouldn't have been nearly so fun! A big thank you also to those of you who purchased my paintings. Deb, I will get yours in the mail next week. As I've mentioned, I often walk around the track at the nearby golf course. It's a really beautiful place with a couple of ponds and a little lake full of ducks at one end. In the late spring one of the ponds is filled with fabulous water lilies. At one end there is a patch of yellow water lilies and at the other end there is a huge patch of pink waterlilies. The stems were was what fascinated me about this composition. I love the way they twist and turn and move under the water. I did start a larger painting of this last year at the Moss Street Paint-In, but I have I found it difficult to concentrate on the intricacies when speaking with so many people. I have yet to pull it out and finish it, but now that I have done this little study, perhaps it will be easier. Second to last painting! What will I do with all of my time when this is done. I will preface this post by apologizing to my grandson and his parents. I have not done him justice and I can see a number of things that need correcting. But, this was my painting for the day and so I am posting it anyway. I will go in tomorrow and fix what I can see needs fixing and hopefully it will be more of a likeness. 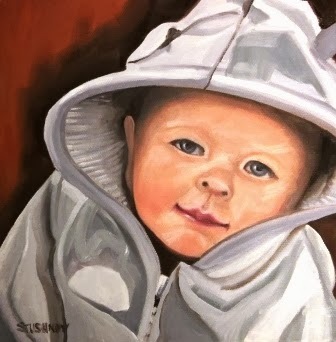 It has been a very long time since I've painted a portrait and it was definitely challenging!!! For starters, it would have been much easier on a slightly larger canvas. I'll just leave it at that! Oh so fun to let the kid out to play! I fought with the tomatoes in the morning, so yesterday afternoon when I came home from my doctor's appointment (most excellent news) I decided to have some fun. A few years ago now, one of my best friends (who is like a sister to me) was transferred to an RCMP detachment in Sanikiluaq. For those of you wondering where the heck that is, Sanikiluaq is part of the Belcher Islands chain on the southeast side of the Hudson Bay, Nunavet. You have to fly in and out of the area and she and her husband only come out for a break of a few times a year. On one of the first trips out, she brought me some inukshuk soapstone carvings. This particular one was carved by an artist named Jerry Eyaituk. Because it is in human form is called an inunnguaq. I know that most of you are familiar with them as the symbol of the Vancouver Olympic Games. I've been wanting to paint this for a while, but a plain cloth behind it simply wasn't doing anything for the composition, so I went and did some research of the northern lights on the internet. Wow, they are so inspiring for a colour pig like me!!!! There is such a variety too. Some are mostly green, some have fabulous hot pink and purple and there is a variety of "flow" to them as well. I felt that I wanted to have some movement in my lights to contrast with the geometric shapes of the inukshuk. The background took shape rather organically as I hadn't really planned out the colours, but I think it worked in the end. I felt a bit like I was channelling Ted Harrison! I'm behind one again! Actually I did dabble in the paint yesterday; a little seascape that was so dreadful that it got wiped! But I have plans for my second of the day and will get to it after I return from an appointment. I can tell that we are getting to the end of the challenge because I am running out of the desire to paint these little ones and want to move on to some larger work. I can see now looking at this that the leaves on the tomatoes could use a few highlights. "Tulips in a Milk Bottle"
I bought these tulips on the same day that I purchased the primulas, so I thought that I had best get them painted before they expired! I've had a couple of Avalon glass milk bottles kicking around for awhile now. They are actually from whipping cream, not milk, so not quite as tall. Definitely a fun shape to paint. Well, this painting was a bit of an exercise in frustration!! 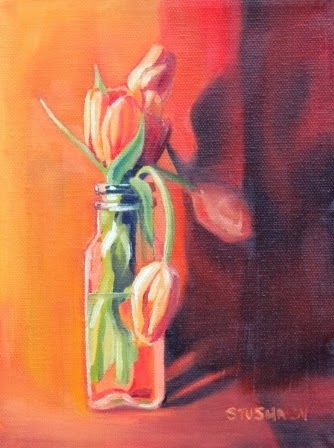 The tulips were fun to paint (except for the one in shadow), the milk bottle was REALLY fun to paint. The background, NOT SO MUCH! Originally I had a lime green cloth on the far right side, but it just wasn't working. The contrasts were competing too much with the flowers and the milk bottle. I also realized that I had positioned the fold where the colours of the cloths changed to far to the left and it felt like it was in the middle of the painting. After a couple of "wipes", I came up with something that I feel works and called it a day. Lesson of the day . . .don't give up! I was happy with the looseness of the tulips and the milk bottle . My apologies for the bit of glare that is in the shadows. In our backyard we have a beautiful, white lilac tree and in late May it is full with blooms. I have always adored the smell and so I get out every vase that I have and fill them all with lilacs. The fragrance is intoxicating and it fills the house for about a week. This was one little vase that I had sitting on my windowsill last year. This was an interesting experiment. 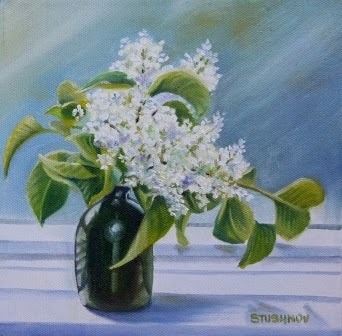 I have never painted lilacs before and wasn't quite sure how I was going to go about getting the effect. 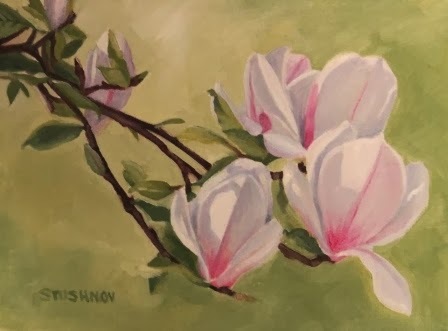 I like to paint detail, BUT, I was not about to put every little lilac blossom in. Unfortunately, the photograph isn't able to capture every little nuance in the shading, but I'm not displeased with the outcome. 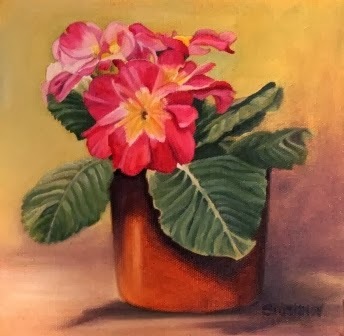 The other day I was at the grocery store to pick up a few things and I finally succumbed to the beautiful cheerful colours of the primulas that were lined up on the shelves outside. Hmmm....what colours to buy . . .3 for $3.98 . . . I've been on a white kick lately, but no, they didn't have enough colour. Yellow? tempting but all of the blossoms on the yellow ones were tiny. The purple with the yellow centres were a must have, there was a nice deep rose one with lots of babies waiting to bloom and these pink ones with lots of big flowers. I had mixed feelings about the background on this one. I had loosely toned the canvas with transparent orange and it was really tempting to just roughly sketch in the pot with paint and throw a splash of white on it and call it a day! I think that the primula itself would have definitely been the highlight. I may try that another day. Maybe with the purple primulas. So, here is my second offering of the day. It is painted from a photograph that I took on one of my many, many walks along Dallas Road. There is an apartment building across the street from the path that I walk on and they have a fabulous magnolia tree at the entrance. So, after spending way, way, way to long on yesterday's painting, I decided that I would put a time limit on this puppy. That way, I wouldn't be able to get all precious and overwork it. I have to confess, it was extremely liberating and I had a lot of fun painting it!!! Started at 11:15 and finished it at noon! My daughter gave me a beautiful book about Emily Carr for Christmas and this morning I was thumbing through it. It inspired me to pull up the images that I had taken at Thunderbird Park many moons ago. #19 of 30 . . . . .I had a errands and chores to do today, so wasn't sure if I would get to paint or not. There's a golf course, only a couple of blocks from here and I love to walk the chip track there. There are houses all the way around on the outside of the track and the golf course on the inside. At the top of the first rise in someone's backyard, there are some bushes that have these lovely delicate white flowers. My camera says that I took the photo a couple of years ago at the beginning of June. I'm not sure what kind flower it is, but on closer inspection of the other images, I'm thinking that it might be a clematis. I loved the play of the white against the wild green leaves! My thoughts while travelling the path to ten thousand hours and beyond . . . It has been said that it takes 10,000 hours of practice to become a master at something. I'm not even close to my 10,000 hours but I'm looking forward to continuting the journey and documenting it on this blog. I paint in oils and acrylics and also like to play with watercolours and printmaking. 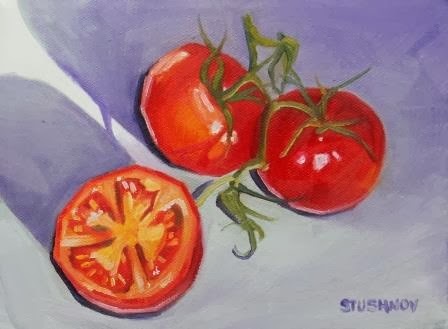 My first love is painting still lifes but I have recently begun plein air painting and am enjoying the challenges. Enter your e-mail address to follow my blog. Unauthorized use or copying of the material on this site without express and written permission from Sharlene Stushnov-Lee is prohibited.